Just a few hours ago, I got this question from TP Friend, Jam Cruz, on Twitter. 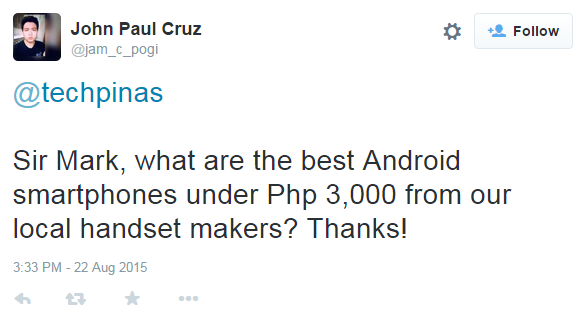 He's inquiring about the best smartphones from our local companies that are priced at less than Php 3,000. I actually often get this question from a lot of you guys -- and understandably so. I know that many of my readers are still in school (around 90% of my readers are 16 to 35 years old) and just rely on their saving from daily allowances when buying gadgets. That said, I deemed it best to create the list below for your benefit. In crafting this, I revisited the 2015 product line-up of our top Pinoy handset companies and chose the phones that fit the description. Check them out, guys. 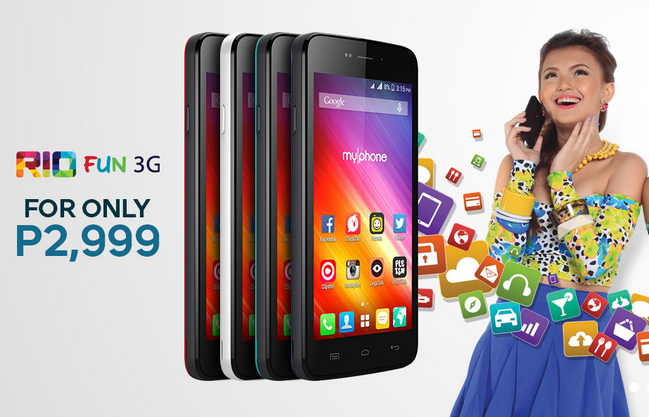 The most affordable Android smartphone in MyPhone's current catalogue is the Rio Fun 3G, which sells for only Php 2,999. A member of the very popular Rio Series, this 3G-enabled Dual SIM phone features a 5-inch WVGA display, 5 MegaPixel main camera, VGA front cam (TBC), and is powered by a 1,800 mAh battery pack. It runs a slightly customized Android 4.4 KitKat operating system with a 1.3 GHz Dual Core processor, has 512MB of RAM, and 4GB of expandable storage. As of today, Happy Man - maker of Starmobile phones, tablets, and hybrids - have two Android handsets that are priced at less than Php 3,000. The more expensive one is the Play Club that goes for Php 2,690 and is available in a number of youthful colors. That phone has a 4-inch 480 x 800 pixels WVGA display, 5 MegaPixel fixed focus main camera with LED flash, a VGA front cam, and a removable 1,400 mAh battery pack delivering up to 7 hours of talk time, according to Happy Man. 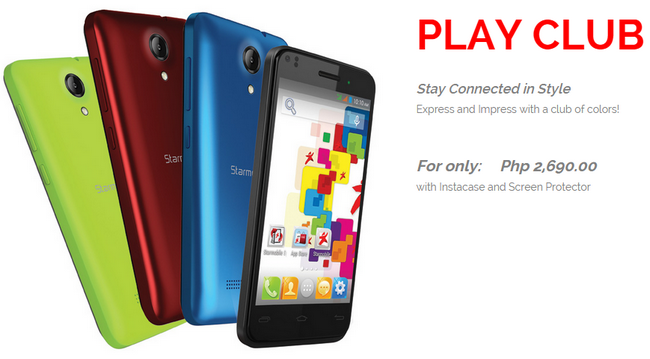 At its heart, Dual 3G Standby Play Club runs Android 4.4 KitKat OS with its Dual Core 1 GHz ARM Cortex A7 and Mali 400 GPU based MediaTek MT6572 chipset, has 512MB of RAM, and 4GB of ROM that you can easily beef up using the phone's microSD card slot. Starmobile Vida costs Php 200 less than Play Club but has almost the same internal specifications apart from its smaller 3.5-inch display and mere 1,300 mAh battery pack. If you're a Starmobile fan and you can't decide which of those two to get, I would suggest that you just go for the Play Club -- if only because of the bigger display, which lets you type faster and enjoy photos and videos more. Cherry Mobile, the top handset seller in the Philippines, has a number of great sub-3K Android phones in its 2015 line-up. 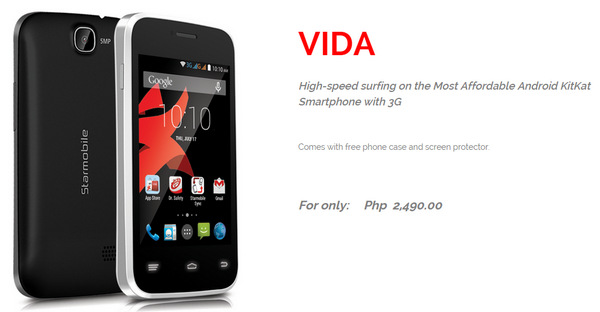 But my favorite currently is the freshly launched Cherry Mobile Touch HD, which you can get for only Php 2,999. Donning such price tag, this handset has just become the most affordable smartphone running Android 5.1 Lollipop that's available nationwide. That alone is a cool accolade but that's not the only that's of note about this model. It's also quite packed in terms of technical specifications. 3G-enabled Dual-SIM Touch HD is equipped 5-inch HD IPS panel, an 8 MegaPixel autofocus camera with LED flash, 2 MegaPixel front cam, HD video recorder, and a 2,000 mAh battery pack. Under the hood, it runs on a 1.2 GHz Quad Core chipset, has 1 GB of RAM, and 8 GB of expandable storage. In terms of operating system version and technical specs, objectively, Cherry Mobile Touch HD is the model that gives the most value for money in this list. 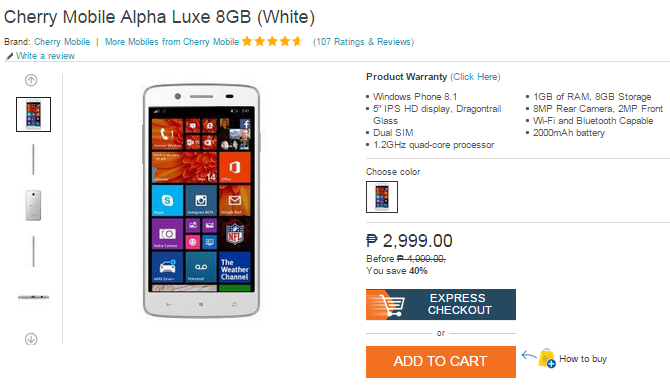 CM has also recently slashed Php 2,000 off the regular SRP of its 2014 Windows Phone midrange release, Cherry Mobile Alpha Luxe! Currently priced at only Php 2,999, this handset is real treat for users who want to try out Microsoft's mobile OS on a phone with good hardware, including its 5-inch HD IPS panel, 8 MP + 2 MP camera combo, 2,000 mAh battery pack, Dual SIM capability, 3G HSPA+ support, 1.2 GHz Quad Core SoC, 1 GB of RAM, and 8 GB of ROM. At this amount, this phone is already a steal -- if you like Windows Phone, that is. SKK Mobile is a relatively new player in the local electronics scene but it has grown considerably within the last several months. 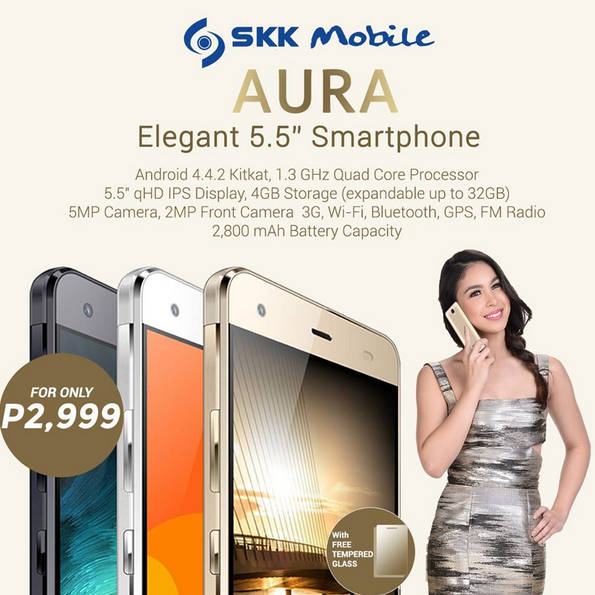 Like Cherry Mobile, SKK is becoming known for offering Android smartphones with good technical specs for a lot less than what its competitors would charge for a similar device. I checked out SKK Mobile's product line-up as of August 2015 and I saw that the company has a number of sub-3K Android phones. 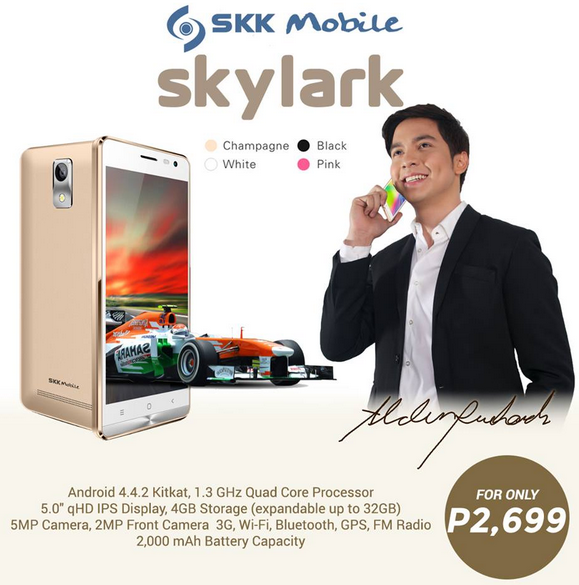 Of all of them, the two that standout are SKK Skylark and SKK Aura, which sell for Php 2,699 and Php 2,999 respectively. Both share largely the same design identity replete with chrome accents and similar technical specs including the 5MP + 2MP camera combination, 1.3 GHz Quad Core chipset running Android 4.4.2 KitKat OS, 1GB RAM for multitsaking, 4GB of expandable storage, 3G HSPA+ support, and Dual SIM capability. The main difference between these two models is that Skylark has a smaller 5-inch 960 x 540 pixels qHD IPS display and 2,000 mAh battery while Aura is a full-fledged phablet with its 5.5-inch qHD IPS panel complemented by a 2,800 mAh pack. So there you have it, TP Friends! These are the top smartphones from our Pinoy handset makers that are priced at less than Php 3,000. Note that we only considered technical specifications for the inclusion of each model in this list. Obviously, there are other factors that you need to think about or examine before making a smartphone purchase including durability and quality of after-sales support, among others -- and those aren't account for in this list. What do you think about these phone, TP Friends? Which of them are you most keen on checking out and purchasing for yourself or a loved one? Can you suggest other sub-3K Pinoy Android phone models to be included in this line-up? Share your thoughts in the comments section below.